You're a busy gal and sometimes it's hard to find time to style the perfect spring outfit when you're in a hurry. 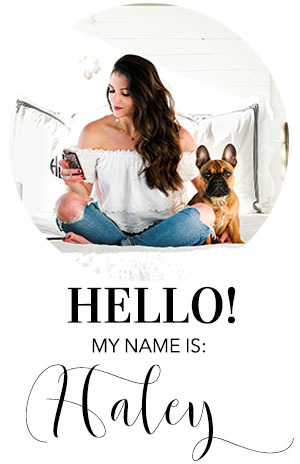 I'm right there with you and that's why I wanted to share these 4 simple styling tips to creating effortless spring outfits! This way we can always have amazing ensembles no matter how much time we have to get ready! It might sound silly, but planning spring outfits will come in handy for those times when something last-minute comes up! I do this two ways; the first one is when I purchase a new piece (like this stripe tee from my spring key pieces list), I find some time on the weekend to create 3-5 outfits with that item. The second way is planning spring outfits whenever you find time. I usually shop my closet and try to create new outfits with old pieces. Either way, I take a selfie of each look and store it in a "spring outfits" folder on my phone. This way you're ready for last-minute drinks with the girls, a spontaneous date, or just when you're having an uninspired "I have nothing to wear" moment! The third piece rule is simple and one that always elevates any ensemble. Your pants/skirt/shorts are the first piece and your top is the second. The third piece could be a jacket like this amazing draped trench coat, a vest, scarf, sweater, or even a denim shirt tied around the waist! 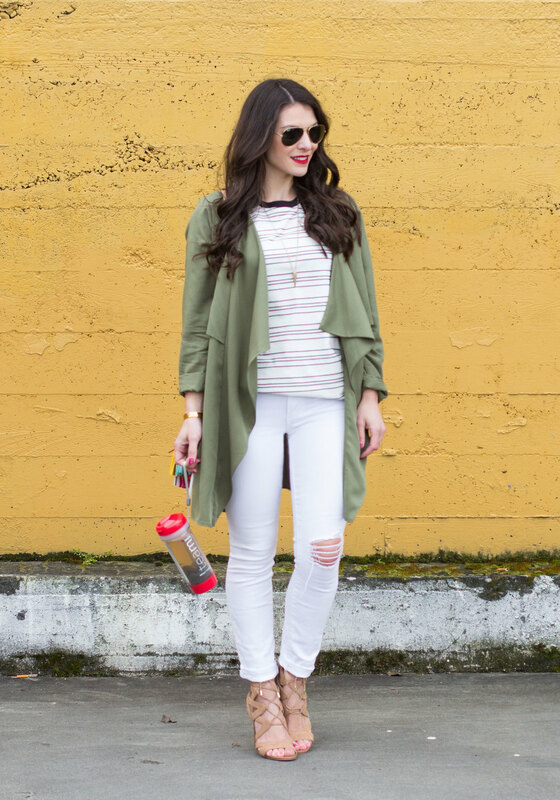 When you're wearing basic colors, a pop of color will help take your outfit to the next level! For this ensemble, I chose my DIY Rebecca Minkoff Sofia bag. Statement necklaces are also a wonderful way to add a dose of color or you could even go with a statement tassel earring! Nothing completes a cool-girl ensemble like the front tuck. Although it's carefully crafted by pinching the fabric and tucking it half way between your hip bone and your navel, it looks effortless and relaxed. 5. INVEST IN A PAIR OF THIS SEASON'S "IT SHOES"
It shoes are the ones you'll be seeing everywhere and are on every fashion girl's wishlist (or feet)! 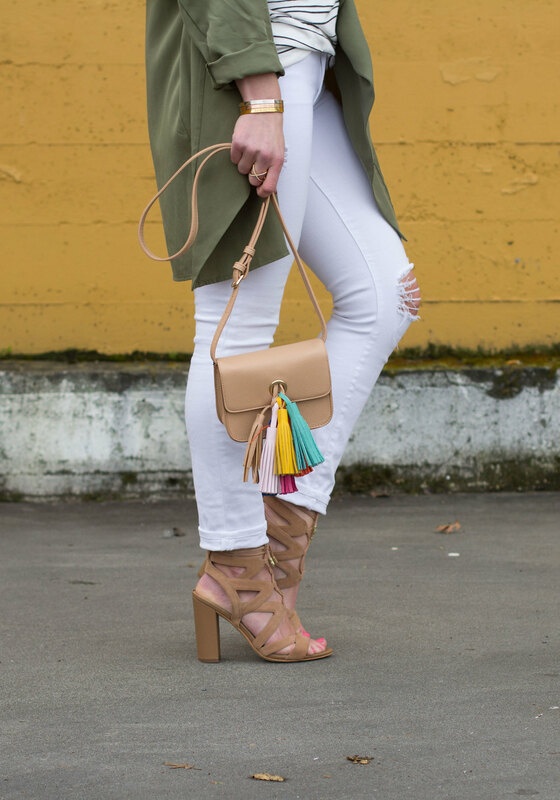 This season, I would say that the Sam Edelman Yardley sandals are definitely on that list, but I'm also coveting the Steve Madden "Sassey" fringe sandals and the Sam Edelman 'Azela' tassel lace-up sandals. With these tips, you will be a master of cool-girl style this spring! If you'd like more daily style inspiration, follow me on Instagram, Pinterest, and Facebook!